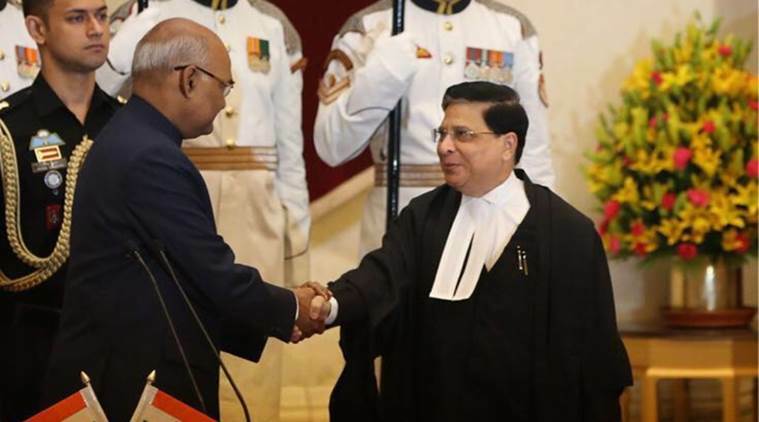 Justice Dipak Misra took oath as the 45th Chief Justice of India on Monday succeeding Chief Justice J S Khehar in India’s top court. Misra was administered the oath of office by President Ram Nath Kovind at the Rashtrapati Bhawan on Monday morning. Justice Dipak Misra who is the senior most judge in the top court will have a tenure of 14 months and will demit office in October 2018. The 63-year-old Justice has been a part of several key verdicts, such as sending Mumbai blasts to convict Yakub Memon and four men who raped and killed a physiotherapy intern to the gallows. Justice Dipak Misra who practiced constitutional, civil, criminal, revenue, service and sales tax matters at the Orissa High Court and the Service Tribunal began his career as an advocate in 1977. He was appointed as an additional judge of the Orissa High Court in 1996 and transferred to the Madhya Pradesh High Court in 1997. Justice Dipak Misra became a permanent Judge towards the end of 1997. In 2009, Misra assumed the office of Chief Justice of Patna High Court and later became the Chief Justice of Delhi High Court in 2010.He was appointed a Judge of the Supreme Court of India on October 10, 2011.